Early this morning, I came across a recipe for pancakes that had just three ingredients: banana, oats, and eggs. Whaaaaaaaaatttt you can do that?! Make pancakes with just bananas, oats, and eggs?! Noooo wayyy!! Yes way. I know. Mind. BLOWN. So I whirred together a batch this morning. It took all of 10 minutes from whir to belly. I can’t say they’re my favorite, but they grew on me, sort of like how I learned to appreciate whole grain bread vs. white bread. There’s definitely a lot more texture in it, thanks to the oats. The sweetness from the bananas was subtle, so I hit it with some maple syrup afterward, which probably cut the health factor significantly. I have to say, though, I’m feeling pretty good about myself. Those are three ingredients I don’t feel guilty about at all, and would feel downright awesome about feeding my kids for breakfast someday. What an easy way to get a balanced diet into my belly for a nutritious way to start the day! Overall, I think this is one to keep in my pocket for future breakfasts when I’m feeling extra crunchy. 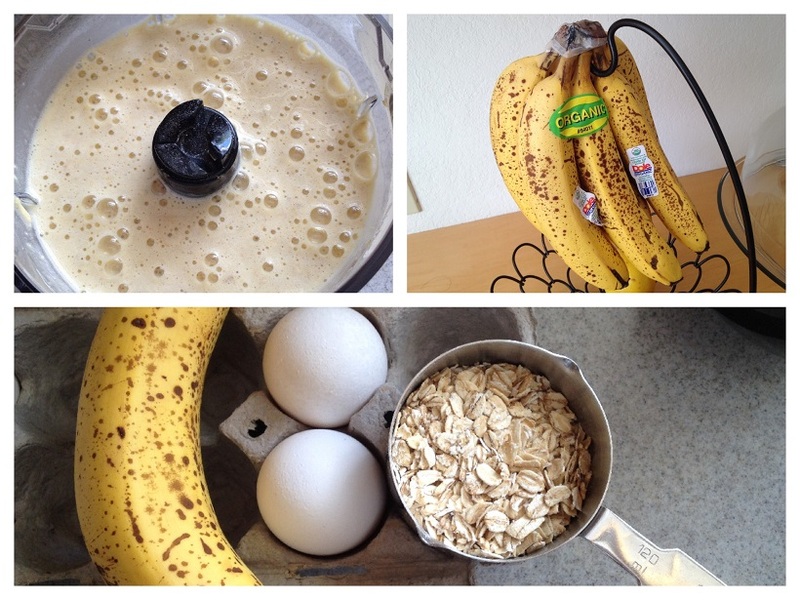 In a food processor, blend banana, eggs, and oats until smooth. Spoon into skillet to make pancakes about 3″ in diameter, as the batter is quite runny and will not flip well if you make it much bigger. Grill in a skillet with butter until golden brown on both sides. Serve with blueberries and syrup (or honey). I love this recipe. I use my ninja to mix the batter let it set up while my pan gets warm. For toppings a little extra chopped banana and pecans with some syrup. I’m so happy to hear it! Thanks for sharing, I’m gonna try the pecans next time! These are awesome! 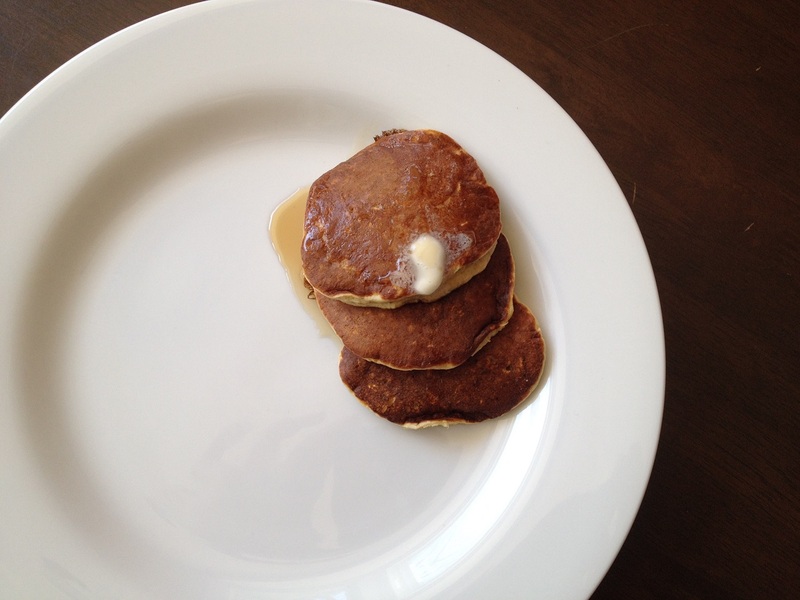 I was looking for a great ratio for banana oat pancakes and knew I didn’t want wheat flour. I added a little vanilla, salt and baking powder so they’d get fluffy. And I tripled the batch so my kids have breakfast all week. Thank you! Wonderful! Thanks for the tips! These are excellent, my kids ask for these regularly and are so easy to make it is impossible to say no! Thanks for the awesome recipe. Hooray! I’m so glad you are all enjoying it :)! My daughter makes these every morning. I thought I would try them because they smell so good. I mix mine in a magic bullet, I think it makes it thicker because of how fast it blends. Mine turned out great, I found it got thicker after letting sit for a few minutes. We serve ours with fresh strawberries and cinnamon and turkey bacon on the side. Delicious and healthy. So glad you like them, and thanks for sharing the tip! I’ll try letting them sit out a bit before cooking them up next time! Horrible! So runny you can’t even fry them! Even after I tried to thicken them! Don’t waist your time and groceries! The first bad recipe on pinterest I’ve tried. Fair point. These ARE really runny, which is why I make them about 3″ in diameter. Sorry I did not note that before– I have updated the recipe to reflect the change!